several of these pop up as I'm loading. Also stats seem to be changing. A lot. My top guys went from 68-75 to 58-61 in potential suddenly. Can't help to think this has something to do with it. Uninstall reinstall did the trick. Code/windows. It happened again... Anyone else experiencing this bug? Im having the same problem. 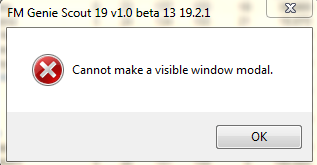 Did uninstall, updating version. Nothing works. Another problem is regarding ads. Everytime ads changes, a popup shows script error. It will triggers until Genie Scout can't create visible modal. @klangard: Regarding the access violation error, try running GS as admin. Right-click on the GS icon and select "Run as administrator". For the wrong data issue, it means your key file is not working; most likely because you tried it on a different computer. If that's the case, you need to ask Eugene for an extra key via email (make sure to pass him the unique ID of that other computer). @The Strongest Decoy: Can you please share a screenshot of the script error? 1. 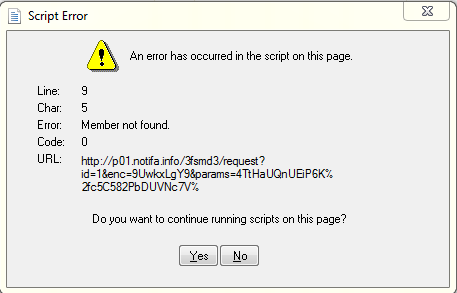 Here's the script error, if I chose not to run the script, it will keep on popping up everytime the ads is changed. It also happens when I open player profile as there's ads in there too. 3. If I didn't click anything, it kept on popping up. 4. This is what happen after a few times closing the error. 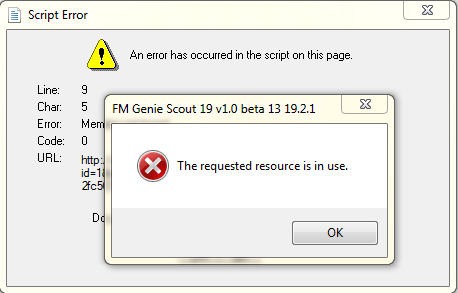 After this, the genie scout basically stop working, can't do anything even opening option in the menu bar. 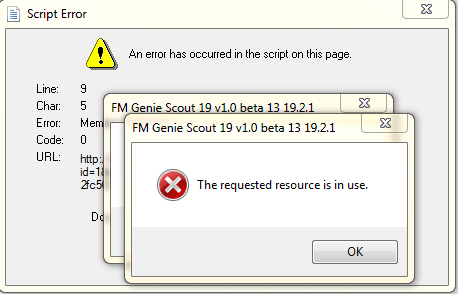 You are reading "Popup errors when genie scout is starting up".